DJI is known for its drones that capture video high in the sky, but the company is increasingly finding success on the ground with other product lines. The Chinese startup on Thursday launched its newest device, the Osmo Mobile, a handle with an electric gimbal (or stabilizer) that attaches to your smartphone. The gadget helps you take stable footage, free of all the bumps and jitters. Simply put, it's a professional-grade selfie stick. It's not the first time the company has offered a high-tech selfie stick. Its previous Osmo models come with a DJI camera on the handle and use your smartphone as a viewfinder, but its latest gadget allows you to attach your own phone. The move will be appealing to consumers who want to save on costs; plus, it comes with the ability to livestream and save footage directly on the phone. Sure, it will add extra weight to your phone -- about one pound -- and subtract some heft to your wallet with its with price tag ($300). But you'll have the smoothest video clips in town, thanks to the Osmo Mobile. 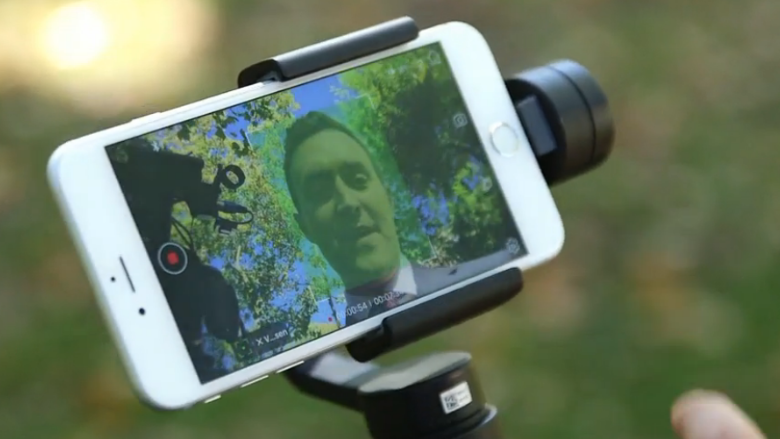 A first look at DJI's Osmo Mobile selfie stick. 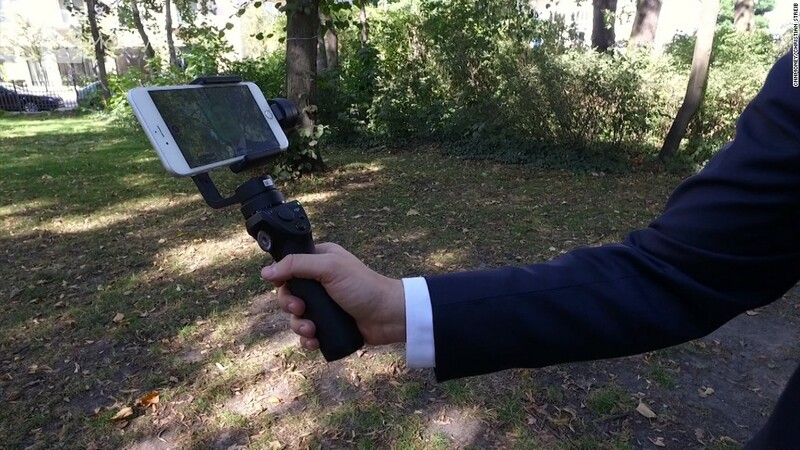 Other companies offer selfie sticks with a stabilizer too, but the Osmo Mobile gives you more control over what you can do with it via the joystick-like handle. After connecting it to a smartphone via Bluetooth, you'll gain quick access to the handle's buttons. One click lets you immediately start recording, while another button allows you flip the camera from selfie mode to the exterior camera. Another feature DJI took straight from its drone cameras is "active track" for narrowing in on an object while still capturing movement in the background shot. Meanwhile, if you're taking a selfie video, you can also lock the camera on your face. Even when you move out of shot and walk around, the phone will adjust to keep you in frame at all times. The Osmo Mobile's active track feature locks in an object, or your face, and adjusts to keep it in the frame as you move. It's also possible to pre-program different positions for the camera to move as it shoots longer-time lapse videos. The battery life will give you four and a half hours of continuous use, but of course you'll need battery power and storage capacity on your iPhone or Android device, too. Related: $650 for a selfie stick? DJI's Osmo line is becoming a favorite for photographers looking to film smooth, high quality video with a gimbal. The positive response to its videography category says as much about its own success as it does about rivals like GoPro. DJI, with roots as a drone company, is now making serious headway in the photography market, while GoPro -- a camera company -- has seen a decline in sales for its action cameras. In fact, GoPro's stock has plummeted from highs of nearly $100 back in 2014 to a price of less than $15 this week. Last year, media reports said DJI was looking to raise money from investors at a $10 billion valuation.